Are you attending Dixie State this fall? Click here to view the schedule for the three registration events happening here in SL valley. 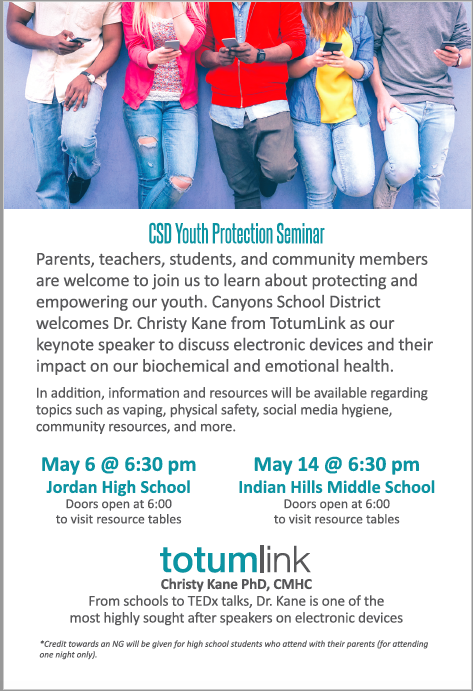 Canyons District will host a Youth Protection Seminar on May 6th and May 14th for parents, students and teachers. Dr. Christy Kane will discuss electronic devices and their impact on our biochemical and emotional health. Click here to view the flyer. Credit towards an NG will be given to high school students who attend with their parents. Summer is just around the corner! If you are interested in attending summer camps and workshops, click here to see what we found for you! It's never too late to apply for scholarships! View upcoming scholarships and contests on our scholarships page. Check out the latest Silver Star Newsletter. Our Silver Star Newsletter is geared toward seniors but is good information for any student as they look towards graduation. Attendance Counts! Be here everyday, all day! Remind 101 is a safe way for us to send ONE-WAY text messages giving you important information about test dates, college deadlines, guest speakers, college visits, student center events, ect. Sign up and never miss another important event! You will receive a text confirming your registration.